By cleaning the evaporator or condenser with GridSoap®, the uptake of energy, due to a free air flow between the fins, becomes optimal. This results into lower energy consumption and better performance. Because GridSoap® ensures a free air flow, the balance in the system will not bedisturbed, leading to a reduced risk of icing. Grielzeep® is ready to use and provided with a hand sprayer. 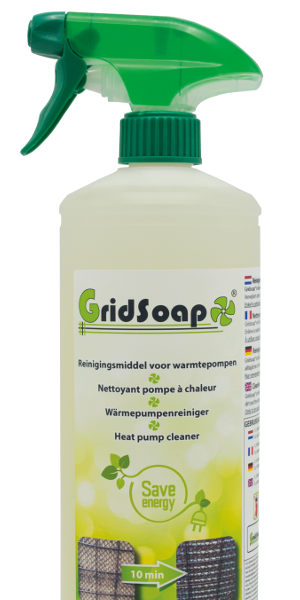 GridSoap® thereby allows to dose depending on the soiling of the evaporator or condenser of the heat pump or air conditioner. A cleaning takes barely 10 minutes. Cleaning with a high pressure cleaner makes that that fins are pushed flat, which causes irreversible damage. Neither a vacuum cleaner, nor an air compressor is powerful enough to remove dirt between the fins. In addition, the heat pump is in many cases provided with grating or a net, causing the cleaning to be incomplete. 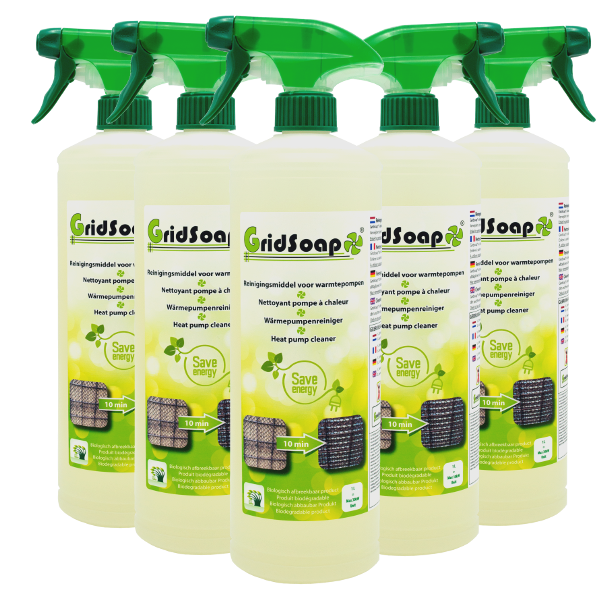 GridSoap® on the other hand cleans also between the fins and even the discharge zone for the condensate. A protective layer by GridSoap® ensures future dirt has less chances to stick and makes the fins more corrosion resistant. Moreover, GridSoap® is biological degradable and by consequent not harmful for planting around the site of the heat pump. Is using GridSoap® harmful for planting around the heat pump? No, GridSoap® is formulated in such a way that it is biologically degradable and planting around is not exposed to any chemical risk. Can I clean my heat pump myself? Yes, you only need to spray GridSoap® on the fins, let it work during 10 minutes and rinse with a garden hose. The only items needed are GridSoap® and a garden hose. Does the COP increase if I use GridSoap®? How much GridSoap® do I need? You can self-determine how much to use, however we recommend to use the mentioned quantity. For of a device smaller than 15 kW, you will need approximately 0.5L and have for a device bigger than 15 kW, and smaller than 30kW will require approximately 1,0L. Do I need a maintenance with GridSoap® annually? Depending on the dirt, we advise to do a maintenance with GridSoap® annually to ensure a free air flow between the fins. Are the instructions clearly mentioned? Yes, on the label there are clear instructions, along with helpful images.